Best Innovation in Billiards since Chalk. The composite eX-Core transfers impact power efficiently from joint to tip (without loss of power thru grain run-off). The eX-Core was designed, developed and tested by Viking Engineers to provide maximum impact with ultimate touch and feel. We only use premium North American Rock Hard Maple that is hand-picked just for the eXactShot. The colder climate allows for slower growth, tighter rings and ultra-dense timber. With all this, combined with our eX-Core technology and patent-pending design, the eXactShot achieves consistent performance with superior Feel. Viking has developed a specially-formulated, high-impact resin SUPER ferrule that is not just reactive, but simply indestructible. The Kamui Black tip is designed to add more spin to the cue ball with less effort. The elasticity of the black leather absorbs the momentum of the cue propelling the cue ball with desired spin. The soft layered tip of the Kamui Black paired with the eXactShot is the perfect formula for an explosive, low-deflection shaft with astonishing response and precision. 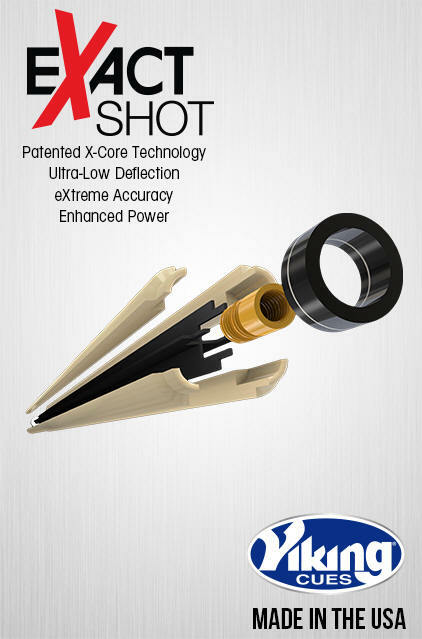 Every eXactShot shaft is 100% made in the USA. Since 1965, Viking Cues have been handcrafted by master craftsmen, each with decades of experience. 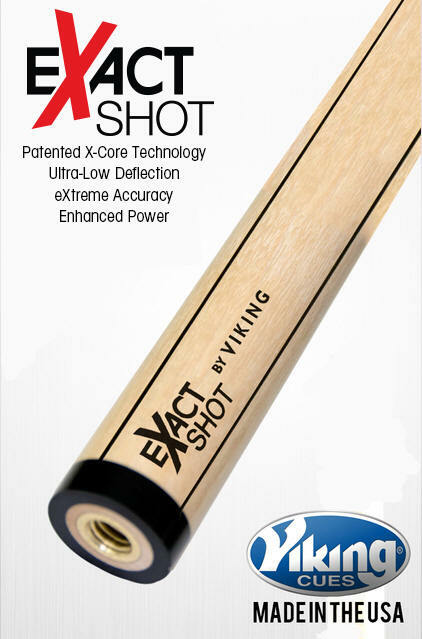 The eXactShot SightLine technology improves your accuracy from the moment you line up your first shot. It's all about PRECISION... whether you are a pro, ameteur, or somewhere in between, the SightLines, running the length of the shaft, ensure proper form and shot accuracy.